Are College Students Liable if Fire Sprinklers Activate in Their Dorm? A question was posted on an online forum that made me sit up a little straighter and pull my chair into my desk. I was ready to read some answers. This person had string lights hung in her/his dorm room, the lights touched the red bulb in the fire sprinkler head and the fire sprinkler activated. Who is responsible for the damage? Well, the consensus was the student was liable with a BUT. The student had hung her string lights along the ceiling and was removing them when they touched the fire sprinkler head. The fire sprinkler activated and destroyed her items and damaged the room. The fire department had to come out and turn off the water. There were significant expenses incurred. The student wants to know if the school will cover the damage. 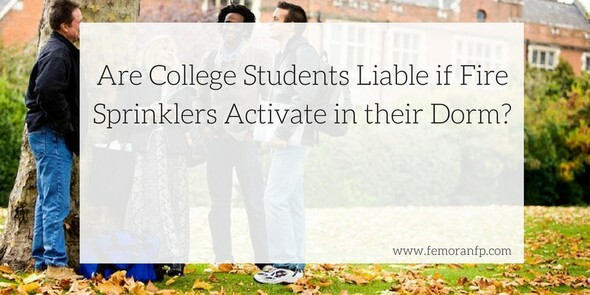 The student is liable. Without his/her influence, the fire sprinkler never would have activated. However, if she/he is still on her/his parent's homeowner's insurance, the policy may cover the damage. The student would need to make a list of all items damaged and send it to the insurance company. An adjuster will contact the student and record a statement. At this point, the insurance company can decide whether or not they will cover the damage. Note: The student's parents did not have insurance and he/she was not covered.